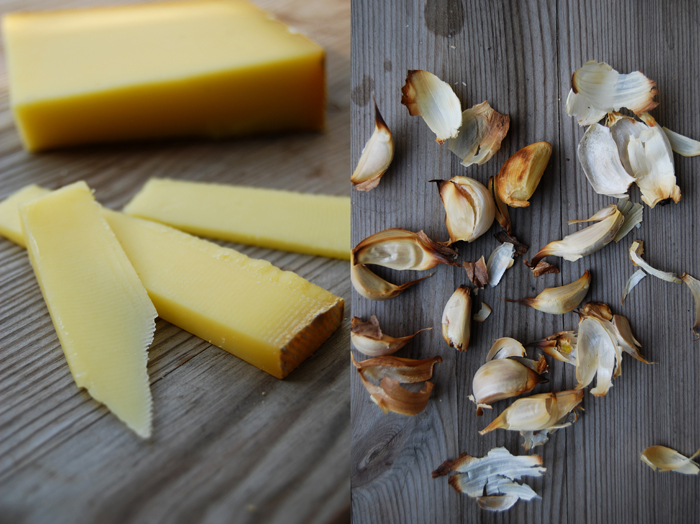 Garlic roasted in its skin is one of these things I can never have (or make) enough of. No matter how many of these little cloves I throw into the hot oven, I always feel like I could have made more. They cook in their delicate peel like in a little parchment pouch, steaming, softening and unfolding all of their wonderful flavours. It tastes less spicy than raw garlic but yet so aromatic, almost sweet and the texture is smooth, a bit oily. It’s a great spread on bread! Garlic is considered a natural antibiotic which has lots of positive effects on the body. It strengthens the immune system, stops free radicals and slows down the aging process. A tiny bulb that does a lot of good for our body! 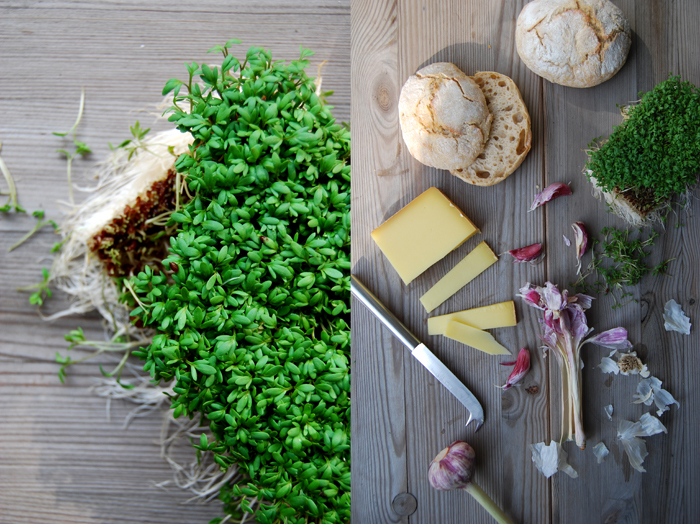 I strongly believe in the healing and strengthening powers of natural and good quality food. This is one of the reasons why I buy organic food as much as possible. I want natural food which is kept natural, no GMOs, no pesticides, food attuned to the ecological system and not against it. A few years ago I started to drink organic green tea with freshly squeezed lemon juice every morning, since then I haven’t had a cold or become sick! 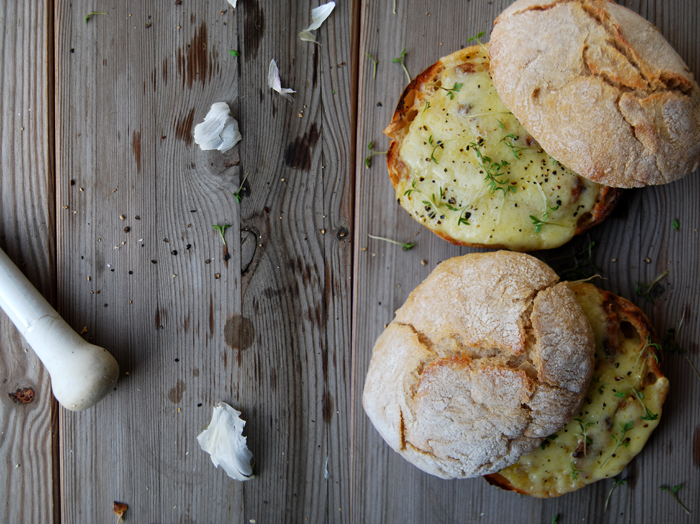 There must be something in garlic that my body loves and when it comes to roast garlic I feel like I could eat it with a spoon, in strong doses like in this sandwich made with 14 cloves of garlic for just 2 buns! I baked medium sized cloves of garlic in their skin in a 210°C / 410°F hot oven for about 12 minutes until golden and soft (you can cover them with aluminum foil if they start to get too dark). They were so soft that I could mash them with a fork, I just added some salt and spread the paste on the buns. I put a couple slices of Swiss Gruyère cheese on top (120g / 4.5 ounces for 4 halfs) and let them melt under the grill for 1-2 minutes until golden brown. I finished my sandwich off with crushed black pepper and some watercress sprinkled on top. 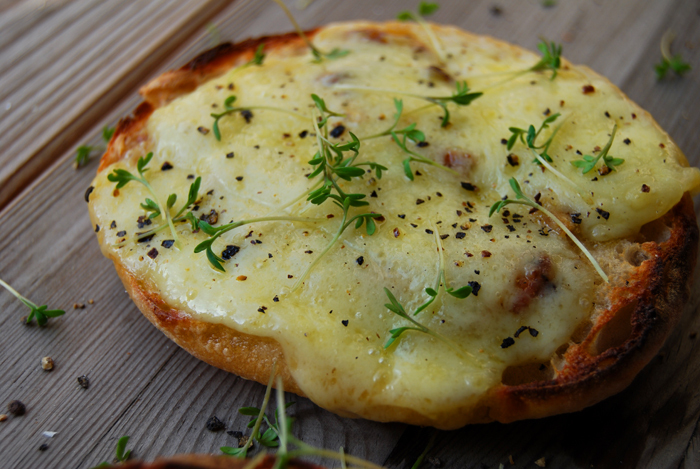 An oily and dense Ciabatta bread would have been good too but when I saw the Swiss Buns at the bakery which have a similar texture to the Italian bread I thought they would match the Gruyère cheese perfectly, it became a delicious and healthy Swiss sandwich! I’m a total roasted garlic fiend and I absolutely love the idea of this sandwich! 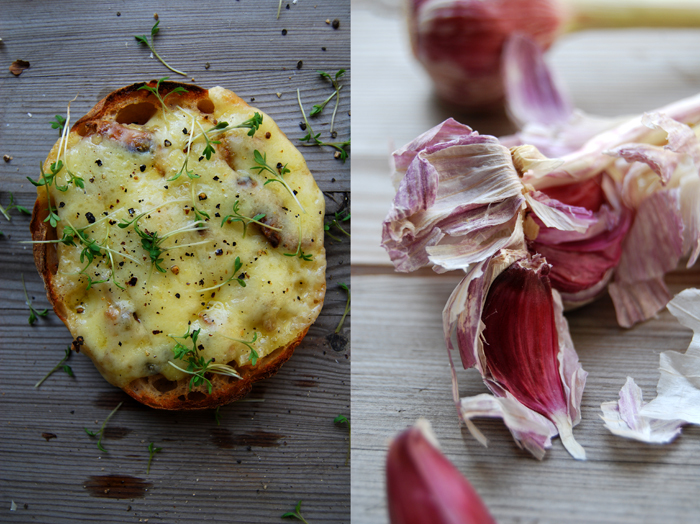 Love this sandwich Meike I’m a big fan of garlic as well, your pics are amazing!